Red Hat Linux 2.1 may be used for a wide variety of purposes including networking, software development, and as an end-user platform. Because of the wide variety of software that is included in Red Hat Linux, you can use it as a server or desktop at work or at home. 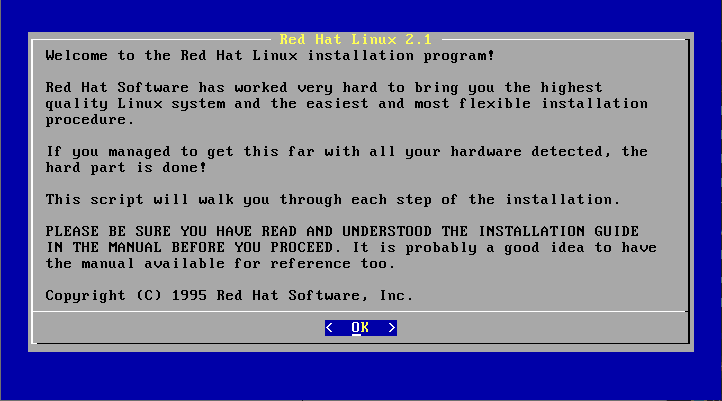 As a server, the capabilities of Red Hat Linux are abundant. Red Hat Linux can be set up for use as a web server, email server, DNS server, news server and more, for multiple sites, with virtual hosting. There’s no need to purchase additional software because everything you need for these multi-serving functions is included in one package. The included popular Apache web server and sendmail email package allow you to set up anything from a small intranet server to a large virtual hosted server for hundreds of clients. Packages are included that allow easy client/server relationships on heterogeneous computer networks. Red Hat Linux contains all of the software needed for use as a desktop client such as email, browsers, publishing, calendars, internet tools, and much more. The standard user interface combines the power of the X Window system with an easy to configure window manager. Feature: The first Alpha release (January 1996) was based on this version.